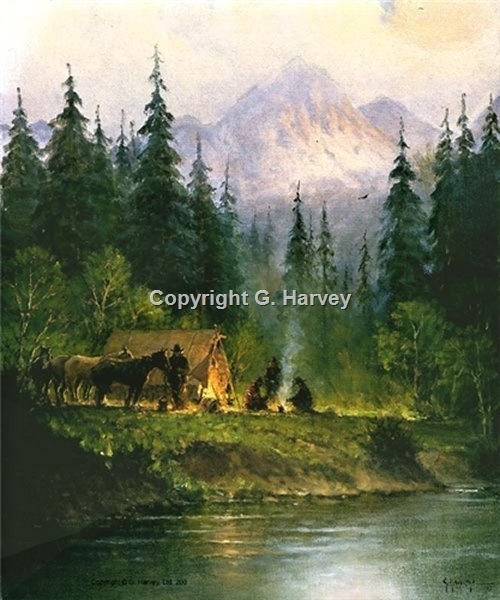 Camp in the Tetons by G. Harvey ~ G. Harvey paints the spirit of America from its western hills and prairies to the commerce of its great cities. He is one of the most respected and beloved artists in America today. The Smithsonian Institution honored Harvey by selecting him for a one-man show. He has been the recipient of many awards and has been the subject of three books. Through his art, our American history lives.